GPX MOTO GOGGLES BE THE EYE OF THE STORM! Developed with WideVision anti-glare, anti-fog tech, Leatt bulletproof Goggles are made to military speciďŹ cation to look the Thrill right in the eye without backing down! Red Bull KTM Factory rider Antonio Cairoli is special, we all know that, and his statistics remind us time and time again. Funnily enough, the Italian legend isnâ&#x20AC;&#x2122;t like Stefan Everts or Jeffrey Herlings and have goals for breaking records, he just goes out, has fun and tries to win on a daily basis. That mentality works for him, and when he took his 87th GP victory at Matterley Basin last weekend, he did it using his brain and waiting for his biggest rival at the moment, Tim Gajser to make a mistake. Cairoli might not have gone 1-1 like he did in Argentina a few weeks ago, but for the KTM man, a win is a win, and the points lead in the MXGP championship is his main goal. We talked to him about his weekend. 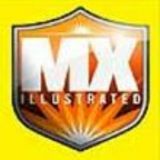 Motocross Illustrated: Last year we all said, and you said it yourself, you were riding better than ever, and obviously Jeffrey helped you get to that level. Where are you now compared to last year? Motocross Illustrated: You just keep winning, now 87 GP wins. Do you still not count your GP wins? Cairoli: I am better prepared this year; my endurance is better. Tim is faster than last year, so we will never know until we have Jeffrey back to his best level, then we will know the situation. What we showed in that second moto is what we showed all last year fighting with Jeffrey. The speed is good, the level is high, and the crash can be there any second on this speed and we saw that with Tim in that first moto and in a second, he was on the ground and he went down hard. Cairoli: No, I didn’t know until somebody just told me. Motocross Illustrated: You always ride smart, you don’t win nine championships without being smart, and in that first moto Tim just took off and you didn’t try and follow him, you could see you were not pushing really hard. Did you think it was too sketchy to push that hard that early? Cairoli: I know Tim is fast this year, he stepped it up this year and he is more consistent and faster in each lap. You could see in the second moto, we pulled well away from the rest big time. I think he is going fast and of course, I also didn’t feel 100% coming into this race with this shoulder and neck problem and I don’t want to risk something. I know he was fast at this track and he passed me quickly and I was struggling in the first 20 minutes. It wasn’t good for me, but overall, we are happy with another GP win and stretch the lead. Motocross Illustrated: I know you probably are happy to win the GP and not win the second moto, but you are a winner and not beating Tim in that second moto just have hurt? Cairoli: Yes, I don’t want to finish second, when somebody beats you there is something burning and this keeps me riding, because if I don’t have this, then I am not thinking correct to be a racer. You must care about the racing and not just be here for the money. I want to improve and be better. Thomas Kjer Olsen of the Rockstar Energy Husqvarna team showed in the opening round in Argentina that his speed is good against defending World MX2 champion Jorge Prado, but he just couldnâ&#x20AC;&#x2122;t get close enough in the early stages of the races in Patagonia. April issue of our FREE online magazine. Antonio Cairoli and Thomas Kjer Olsen talk about their victories in England last weekend.